It has been over a month since I posted, not good. 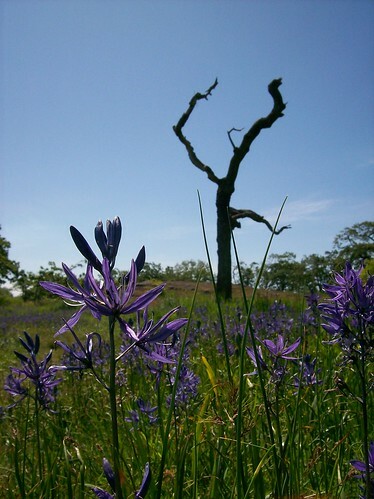 However, I have been busy with the end of the school term and a trip to Hawaii — you can see some of the pictures my brother took here — so to placate all my readers, a picture of Camas with a Garry Oak in Uplands Park. I will be at the 12th Annual Bowker Creek Rubber Ducky race tomorrow near the fire hall and Oak Bay Rotary’s “An evening in Tuscany” fundraising dinner. Hope to see you all tomorrow morning. Saanich has recently launched a project to rethink the Shelbourne corridor, or at least the section from the Victoria border to Feltham Rd. in Gordon Head. The project is partial update to the venerable Shelbourne Local Area Plan, last changed in 1997. To kick off the whole thing off, Saanich held an open house to ask for people’s opinions on what they think should be done. I managed to make the last hour of the open house and collected a few notes. Clearly evident was that Saanich is still very much in the information gathering phase. Of the nearly two dozen large boards spread around the room that showed everything from traffic volumes to population densities and average ages to zoning, only one of them had a recommendation on it. That was the proposed Bowker Creek Greenway project, which confusingly does not follow the path of the now-culverted Bowker Creek beside Shelbourne. Not surprising, this was the board that attracted the most interest and more comments. All of the rest of the boards were about the current state of the corridor today, to help people with context for their suggestions. To hep run the event, Saanich had invited members of the two community associations that overlap the study area, Mount Tolmie and Camosun. They had also generously given space to a number of community groups including the Bowker Creek Initiative, who have just launched their draft 100-year vision which partially overlaps with the Shelbourne corridor, and the Shelbourne Memorial Tree Project, who seek to remind people that Shelbourne was planted with trees in 1921 as a memorial to the lost soldiers of the First World War, designed to deliberately invoke memories of France’s leafy avenues. Also in in attendance was UVic’s Office of Community Based Research, who have been working with Green Map project around Victoria. OCBR’s Maeve Lyndon, who came to talk to Oak Bay Rotary about the CBR and the Green Map, Theresa, and Ken Josephson, who recently worked on the Oak Bay Green Map, due for launch tomorrow evening were all in attendance. Beyond providing information, Saanich was also interested in collecting people’s visions for the corridor and thus the questionnaire they handed out not only had a few questions about where you live and how often you use the corridor and how, but had a large map of the corridor on the other side, for free form drawing and collecting of ideas. I don’t envy the planners who now have to decipher hundreds of people’s scribblings and make a coherent report out of it. One of the groups clearly missing was Hillside Mall. Although they are wholly within the City of Victoria, much of the traffic that comes to the mall drives on Saanich roads. They also recently finished a new plan, although the details of that haven’t been released yet. Their Renovations page still says “Watch this space”. 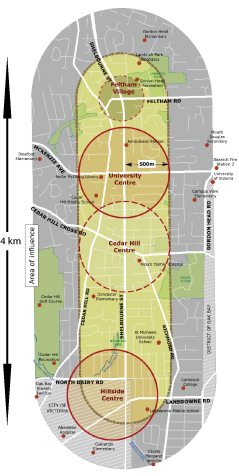 I also understand from talking with the Bowker Creek people I have talked to that their plans don’t involve daylighting the creek, which currently runs on the western edge of the mall, by Doncaster Road and Thrifty Foods. 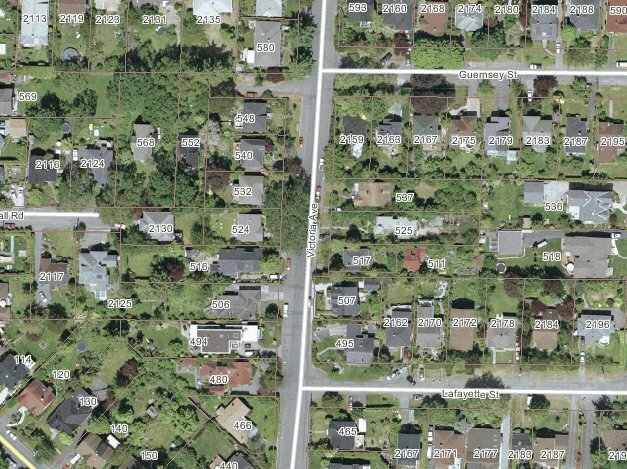 If you want to give them feedback, they sadly don’t have the PDFs of the boards they had up online yet, but the Shelbourne Corridor page on Saanich’s website lists contact information for the planner in charge of the project. The CRD has now identified the three possible locations for the Saanich East/Oak Bay North sewage treatment plant and one of them is in Oak Bay, despite the fact that the only public consultations this month are in Saanich. 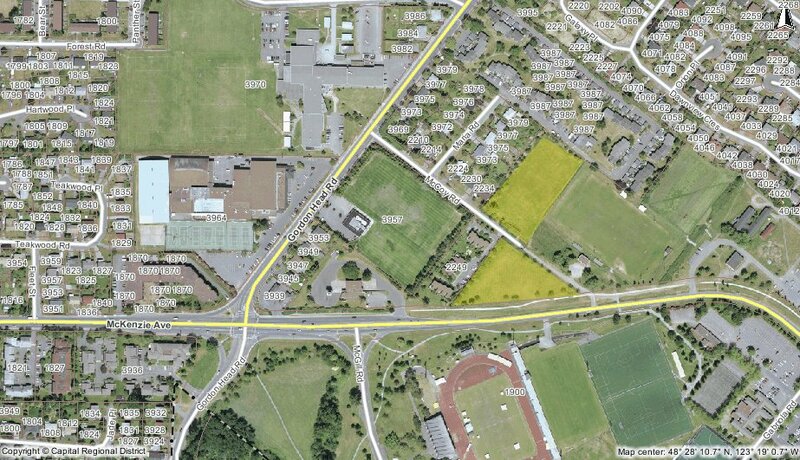 Two of these properties are on UVic land, at opposite corners of the campus. 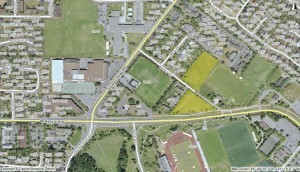 The site in Oak Bay is the old orchard on Cedar Hill X Rd near Crestview Rd as can be seen on the right. This is a part of UVic and is a very common dog walking site. I have no idea how much of the site they are planning to use or if the orchard will remain, but I expect at least some of that information will be at the upcoming public consultations. I wonder what Citizen Canine will say about the possibility of using this location. 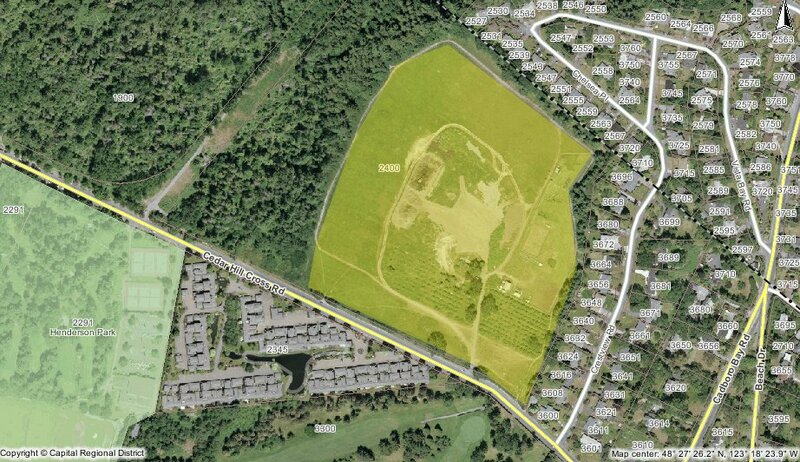 The second site on UVic lands is near McCoy Road in the fields there. Again, I have no idea how much space they are going to take, but I sincerely hope that they don’t remove the trail that connects to the end of McCoy Road. That is a great biking and walking connection to avoid having to go all the way down to the corner of McKenzie Ave. and Gordon Head Rd. 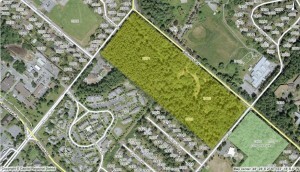 The last site is the previously mentioned lands in Haro Woods that the CRD purchased last year. 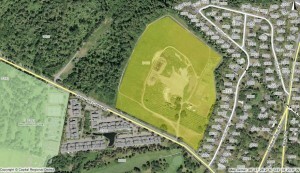 I don’t know exactly where in Haro Woods, as outlined in yellow in the map on the right, but I know that UVic owns a portion as well. There isn’t much more to say about this, except that it is one of the few pieces of relatively intact forest left in the area. Also, there is a large field on Queen Alexandria lands just across the road. In all the years I have been going up that direction, as I used to go to school at Frank Hobbs elementary, that field has been sitting largely empty. Why not use it? Haro Woods, because it has been previously announced, has already attracted a lot of attention. 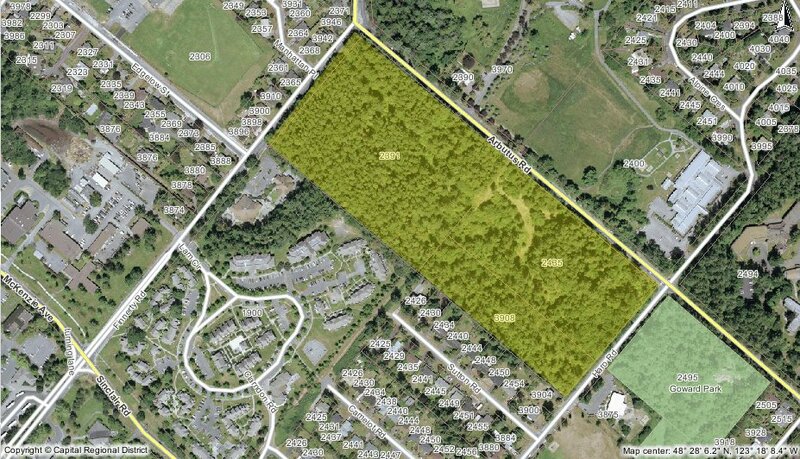 There is a Save Haro Woods website, and the Cadboro Bay Residents Association has come out strongly against this site as well, asking for it be turned into a park. There are two open houses coming up, on the 16th at Gordon Head United Church and the 17th at Cadboro Bay United Church. Both of those forums run 3pm to 8pm. There is also neighbourhood workshop that requires pre-registration on the 22nd of June between 6:30pm and 9pm at the Queenswood Centre. This information and more can be seen on the wasterwatermadeclear’s public forums page. There is also a report from the CRD’s contractor about the feedback from the previous public forums and the principles used in deciding a location. Personally, I like none of these sites, but I think the orchard site is probably least worst, provided the orchard itself survives and public access for walking dogs is preserved. However, if they do choose the Haro Woods site, they are really setting themselves up to fail. I think we will see UVic students and other environmental activists chaining themselves to equipment and tree sitting, potentially delaying the project months. I almost wonder if this is why the other two spots have just appeared, to avoid that very scenario. Last night’s council meeting was an interesting one, not just because of the content but also because there were several split votes, a relative rarity in Oak Bay. There was also a whole variety of things covered, from the Bowker Creek watershed to variances and a shiny red firetruck. See the full agenda (PDF) for the whole list. Nils Jensen was missing tonight and having only 6 did lead to two split votes. First up was a presentation by Tanis Douglas, Bowker Creek Initative Coordinator, and Jody Watson, chair of the BCI, about the BCI’s activities in 2008 and proposed activities in 2009. Tanis gave the bulk of the presentation then Jody then finished with a few final points and a call for funding for 2010 through 2012. There was a lot of discussion about the BCI, but council ultimately approved in principle funding the BCI going into the future.. I will have a more detailed post later today about the BCI’s presentation to council but for now, you can read BCI’s 2008 Annual Report (PDF) or the minutes from 2007’s council meeting about the 2007 report. The Fire Chief then presented his after-the-fact request for council to approve a funding request to the Union of BC Municipality’s Age-Friendly Communities Initiative. Part of the larger World Health Organization’s Age-Friendly Cities, this funding is provided by the provincial and federal governments and Oak Bay is asking for $10,000 to map concentrations of vulnerable people and their potential routes to emergency services. I hope they make as much of data available as possible, in the spirit of open government. The usually boring variance section of the agenda was far from that tonight. One of the most controversial applications was for 2064 Penzance, seen on the map of the right. The new house there had a wall that was over the allowed height and a stop work order had to placed on the building for that and a few other issues. Neighbours of the house were uniformly against it, with several showing up to talk about how the builder had failed to do any community consultation and their fears that the building would be flipped. Apparently the owner or builder was in the audience, but chose not to speak. Ultimately council voted against the variance request 6 to 0. Interestingly, Tara asked about and was told that due to the way the bylaws are written, the owner can take down the wall and put up a roof 1′ higher than the existing wall, a gaming of the bylaws as with the Panorama Rec. Centre’s new slide. Two (2) parking spaces per dwelling unit, one of which shall be within a building. which is totally crazy. Parking is a generator of traffic and if anything the municipality should be trying to reduce the amount of parking, not expand it. Also, parking spaces are usually impermeable, so adding more paved land isn’t going in the right direction to Ian Graeme of the Friends of Bowker Creek Society’s goal of 10% permeability (average residential is about 40%-50%. I don’t know what the exact % is for Oak Bay). The whole parking issue also was amusing for us policy geeks, as the motion to table the motion for variance to allow notice to be given was defeated. This is not the motion to approve the variance, merely the motion to let staff give notice to neighbours that the variance request has been filed in case they want to write and/or speak about it at the next council meeting. However, this left the request in limbo, until a consultation of the Community Charter revealed that the Mayor or any Councillor can request a revote on any motion at that meeting or the next one. No, that didn’t have to make sense. Just know that the inner workings of council are very strictly regulated by provincial law, primarily the Local Government Act and the Community Charter.This often ties council into doing this certain ways. The third contentious issue that has come up a bunch is the Tree Protection Bylaw and how to amend it. 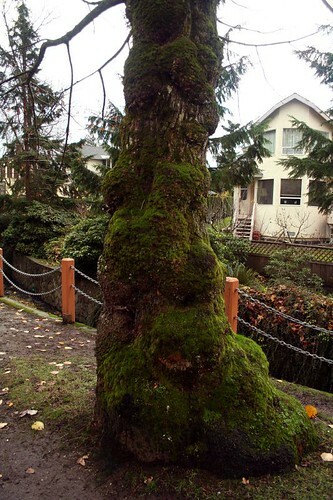 The one debated today allowed the council to make a ruling that any tree could be removed if it caused hardship to the owner, something no other tree protection bylaw has. Braithwaite spoke forcefully for following what the Parks & Recreation Commission suggested to take notes over the course of a year or so and then do a single large amendment, rather than piecemeal edit it. Thankfully today’s motion was defeated, but it was an interesting matchup with Herbert, Ney and Causton for and Cassidy, Braithwaite and Copley against. Not your usual “party line” vote. And in more interesting news, Oak Bay is a getting a shiny hybrid fire engine. It will likely be painted red. Oak Bay was also compared to Rio de Janeiro and New York tonight, in reference to the house on Penzance. This adds to the list of Oak Bay being compared to downtown Vancouver a few months back. Those who wish to attend council in the summer, it has a greatly reduced schedule with Committee of the Whole meetings on July 13th and August 10th and Council meetings on July 20th and August 17th. 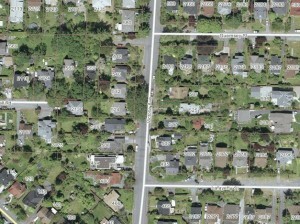 2007 air photo of the 500 block of Victoria St, centred on a large tree, likely the removed Garry Oak. Thats right. It was killed because the road needed to be wider. What can clearly be seen from the photo to the right above is that the road and sidewalk ran almost right against the trunk. As evidenced by this case, driving on a trees roots damages them via soil compaction. But how far out do they extend? A good rule of thumb is the that the roots extend at least as far as the branches or crown does, often further in urban areas. (The Southern Nevada Water Authority has a good graphic and explanation). Parking lot at Camosun's Lansdowne Campus. 2007 air photo from the CRD. Of course, Oak Bay is not the only offender. 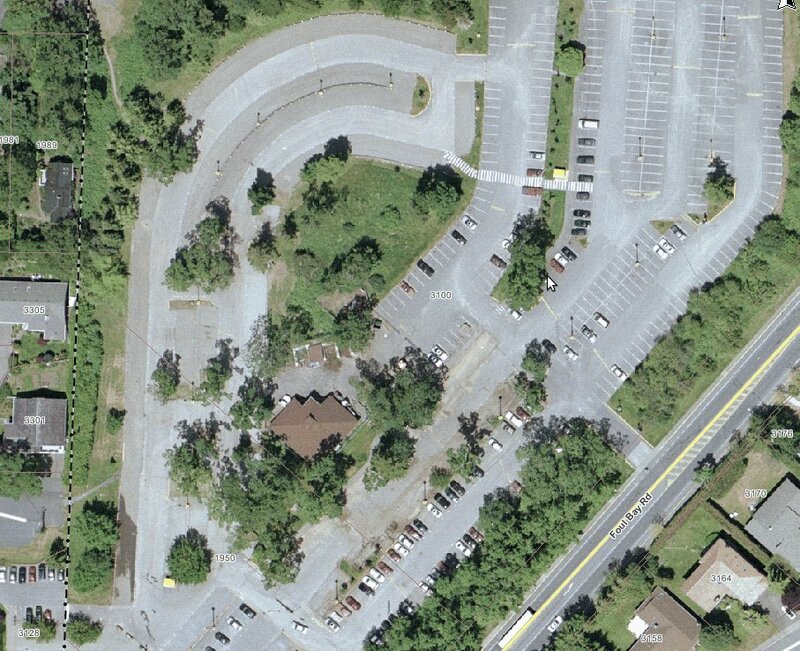 Parking lots are great places to see just how bad it can get for these poor trees. Case in point; the parking lot at Camosun’s Lansdowne Campus as seen to the left. Formerly a Garry Oak meadow, the trees remain but the grass is now concrete. The Garry Oak ecosystem is amongst the most endangered in the world and its centerpiece species, the Garry Oak, the only native oak west of Manitoba. Coincidentally, a lady from the Garry Oak Ecosystem Recovery Team was at Oak Bay council on Monday night looking for some funding to help print their book, The Garry Oak Gardener’s Handbook (PDF link).Thankfully council was able to give them about $200 for 40 copies. She also had a few on hand, so I picked one up and having read through, I highly recommend it. I am looking forward to the newer, larger, edition coming out later this year.